Show your patriotism. Decorate with miniature flags on a toothpick. Add sugar and white chocolate to hot milk and stir to dissolve. Cook gently, stirring occasionally, over medium heat 7 to 10 minutes until pudding thickens and coats back of spoon. Remove from heat and stir in almond flavoring. Pour into a shallow dish to cool, stirring once or twice to release steam. Cover and refrigerate until set, about 20 minutes. Meanwhile, gently wash and thoroughly drain berries. Slice strawberries in half. Cover bottom of dessert glasses with blueberries. Top with a layer of pudding. Place strawberries around glass, with red sides facing out. Top with another layer of pudding and a final layer of blueberries. 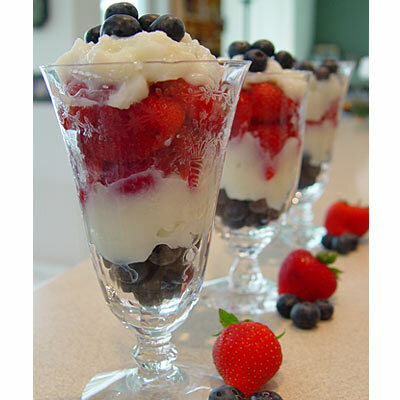 Garnish with white chocolate shavings or whipped topping, if desired.